The Evening Spider is set in both the present and the past, following the lives of two women, both obsessed with uncovering the truth. Frances Barnett has spent the last few years locked in the Northampton Lunatic Hospital. She shares her story with a visitor, telling of how she came to be there, including her marriage to a respected attorney, the birth of her daughter, and the events that followed. Frances has always been interested in science and logic, and has never been content to lead the traditional life expected of a woman during her time in the mid to late 1800's. She would rather examine things under her brother's microscope than cook a meal or sew. Her husband humors here to a degree, but she is still expected to perform her wifely duties in terms of maintaining the household. Frances finds pleasure in hearing about her husband Matthew's cases, especially the one involving a murder. Motherhood does not come easy for Frances. She doubts herself and her abilities. Slowly we see Frances begin to go so far as to question her sanity. She becomes obsessed with the murder trial of a reverend accused of murdering a young woman, needing to know every detail. Her husband grows increasingly worried about her, calls in an outside doctor for advice, and from there, things only get worse for Frances. In alternating chapters, the reader is introduced to Abby Bernacki, a young mother who has taken a year off from her teaching career to stay home with her baby. She's restless and a bit bored, but also feels anxious and begins to isolate herself. When her daughter suffers an unexplained injury, Abby begins to wonder if her house may be haunted. She's sure she heard someone in the room with her daughter when no one should have been there. As her paranoia increases, Abby seeks out the history of her house that once belonged to Matthew Barnett and his wife Frances. I love stories like this, the kind that have you wondering if there is something supernatural at play or if it is something more reality based. Both Frances and Abby may have suffered from Postpartum Depression--some of the symptoms are there. It would explain so much. And yet. . . There is definitely more to it than that. Or so it seems. The novel has a sort of Gothic, creepy feel to it, and I found myself glued to the book, wanting to know just what was going on. I liked how the two threads, the past and the present story-lines were laid out--seeing them come together as they did. As Frances looks into the real life murder of Mary Stannard, she also keeps a journal, a journal which Abby uses to help piece together Frances' life in the hopes of finding her own answers. Abby's own past comes to the fore during the book. The death of a roommate in college haunts her to this day. It seemed a bit out of left field in some ways, but the author manages to tie it in to my satisfaction. Frances and Abby were both such interesting women. I really felt for Frances, having to go through all she did--not to mention how trapped she felt, a woman living in that time period. It was her story I was most drawn to, as I often am in books with two time-lines. The historical story-line is often my favorite. I wasn't sure what to think of Abby initially. It took a while for me to warm up to her, but on some level I could relate to her, and, like her, I wanted to get to the truth. There have been some readers who were quite disappointed in the end, and because I do not want to spoil it for anyone, I will only say that I can see where they are coming from. Still, I disagree. I liked it quite a bit. Sometimes big red bows do not belong on the final pages of a book. 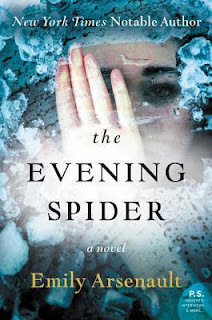 The Evening Spider is a dark and suspenseful novel. A sense of dread hung over me throughout, as the tension built and the story unfolded. This was my first book by Emily Arsenault, but it will not be my last. To learn more about Emily Arsenault and her work, please visit the author's website. She can also be found on Goodreads and Facebook. I generally like psychological thrillers, so I'll put this on my radar. The mixed feelings about the end make me even more interested ... I wonder what I'll think. Beth F - I thought the ending was fitting and I'd be curious to know your take if you do read this one. I think it must be really hard to write a novel linking past and present stories and lives. Glad you enjoyed this one. Harvee - I think it must be difficult to do too, and not every author is able to pull it off as well as others. I did enjoy this one. Definitely one to keep a lookout for, this sounds deliciously dark. Tracy - I like that, "deliciously dark." That's a good way to describe it. Diana - I hope you enjoy it when you read it! I look forward to reading your thoughts on it. Glad u enjoyed this one so much. I like the way this author writes so I will be sure to try this one. Diane - I definitely would like to read more by Arsenault. I enjoyed this one. Normally I avoid anything that is both spooky and contains an infant but this sounds like something I would enjoy. I like that you wonder what's really going on and both Frances and Abby sound like interesting characters. I'll have to look for this one. Katherine - One thing I forgot to mention in my review was how much I appreciated that Abby is a nursing mom and the author doesn't shy away from adding that to the book now and again. It's not a story point at all--just a small detail--but I was glad to see a slice of real life enter into the story, if that makes sense. Oh, I love books set up like this and also books that make you wonder - supernatural or psychological - ghosts or madness? I'm definitely going to read this one. Can't wait!! I've seen this book around and after reading your review the more I'm intrigued with it. Will have to check it out! This sounds interesting not sure if I will ever get around to reading it but I am intrigued. I tend to avoid dark, psychological thrillers, so the fact that you tempted me to even consider reading this one is a tribute to your reviewing skills. I don't think I'll end up reading it in the end (I see the potential for it to resonate too much with my own anxiety) but I may see if the library has it, and take a closer look. Lark - It is a bit dark. I am glad I piqued your interest even though it's not something you'd likely read. :-) I am glad I didn't read it when I was a new mother, that's for sure! Oh this sounds really good. I like alternating time periods and throw in some psychological suspense, well how can I resist! Great review, Wendy! Iliana - Thank you. I hope you like it if you read it, Iliana. I love these types of books too. This sounds like a good one! I have a love/hate relationship with past and present set books, but anything on the Gothic spectrum is generally my cup of coffee. I tend to agree with you on endings- sometimes it's good to have some questions lingering at the end of the book. Litha Nelle - Too perfect or books with everything wrapped up at the end don't fit, do they? Great review! This sounds like something I would enjoy. Like you, I am fond of stories that keep you wondering... is is supernatural? Or something else altogether? I'm adding it to list. Stephanie - I hope you enjoy this one if you do pick it up! The Evening Spider sounds good, I like a nice creepy story. It sounds like the alternating storylines were well written. I love the sound of this one!!! It definitely sounds like my kind of book so I'm adding it to the TBR list! Great review! Samantha - Thanks! I really enjoyed it and am looking forward to trying this author again.